b. horn - has sharp pointed top. Named after the Matterhorn Alp in Switzerland. Has very little vegetation, hasn't weathered enough. 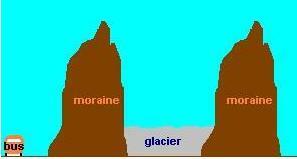 a. moraine - pile of till, can be very tall, can be front, lateral, resessional. 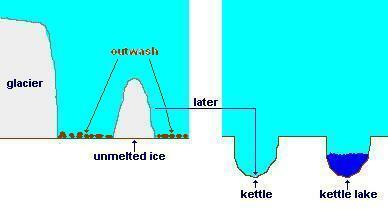 b. kettle - created when a block of ice remains when the glaicer retreats. Many in Minnesota, "Land of 10,000 Lakes", should be 1,000 lakes and 9,900 kettle lakes. 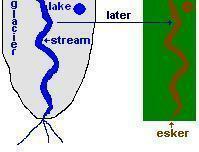 c. esker - hill (ridge) of sorted outwash, sometimes known as a horse bak ridge.